Vinyl has a long history as a flooring choice, but in recent years, it has unfortunately been labeled as ugly and old-fashioned. However, vinyl is experiencing an upsurge in popularity, thanks to new styles and designs coupled with vinyl's traditional durability, low cost, and ease of installation and maintenance. 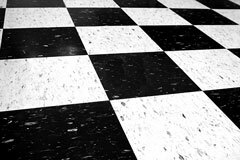 Vinyl sheet flooring and tile are available in many styles and colors, and they can be cut and laid out in patterns. Some vinyl designs even mimic the appearance of more expensive flooring options such as wood, ceramic tile, and stone. Vinyl flooring works well in any room of a house, even in high-traffic areas and wet areas such as the kitchen and bathroom. In fact, vinyl is the most water-resistant of all flooring materials. In addition, vinyl reduces noise and is softer and friendlier to your feet than hardwood, ceramic tile, or stone floors. Before you lay down a vinyl floor, you must first measure the area and choose the best vinyl for your needs. Vinyl flooring comes in rolls, tile squares, strips, and planks. 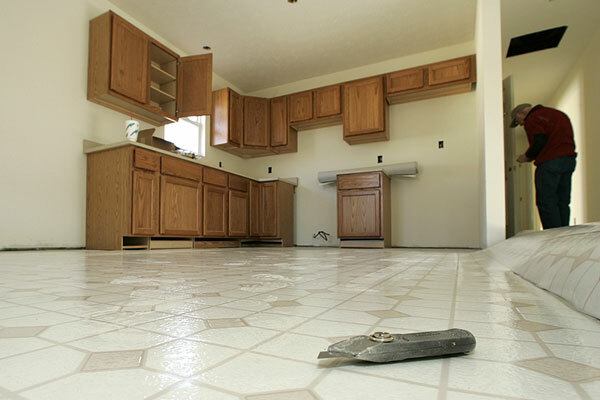 Many manufacturers offer vinyl floors, including Armstrong and Congoleum. Vinyl flooring can be installed over almost any clean, dry surface and can sometimes even be glued directly to old vinyl, ceramic tile, and wood floors. Self-stick vinyl tile is the easiest to install and can be walked on as soon as it is installed. The Family Handyman offers instructions for installing a vinyl floor. Vinyl flooring offers a no-wax surface and easy cleanup. 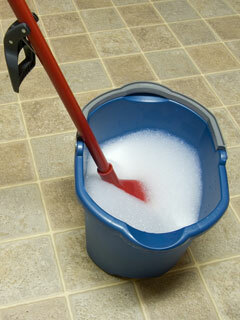 All you need to do to keep your floor bright and clean is to sweep and mop it regularly. Your manufacturer may recommend specific cleaning products, or you can try using white vinegar or mix a tablespoon of borax in a gallon of warm water. The borax acts as a mild cleaner and will preserve the floor's shine. If your vinyl floor becomes stained, the Natural Handyman offers tips for removing stains from your vinyl floor.